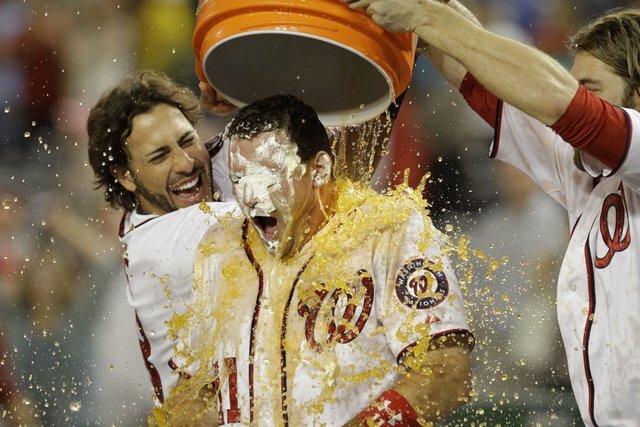 Video: Ryan Zimmerman’s Walk-off Grand Slam Gets Him a Face Pie! The Philadelphia Phillies took a 4-2 lead into the bottom of the ninth against the Washington Nationals with the solid Ryan Madson on the mound. After three straight singles, a sacrifice bunt, an intentional walk and a single, suddenly it was 4-4 and Ryan Zimmerman was up to the plate. As the video shows, on a full-count Madson threw Zimmerman a 92-mph fastball, which he ripped over the left-field fence for a game-winning grand slam to beat the Phillies, 8-4. At the 50 second mark, catch the face pie, which was then followed by the Gatorade bath in the picture (only). This entry was posted in LOL, Philadelphia Phillies, Washington Nationals and tagged Gatorade, Jayson Werth, Kyle Kendrick, Philadelphia Phillies, Ryan Madson, Ryan Zimmerman, Washington Nationals. Bookmark the permalink.